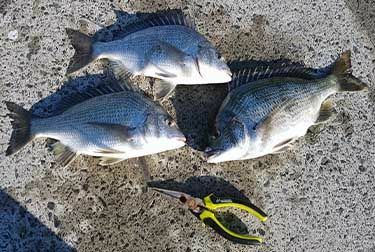 With beautiful sunny conditions Alan Bonnici went for a short fishing session under the West gate bridge. The morning had zero breeze and the the peak high tide was around 8.15. Surprisingly no sign of any Pinkies of Flathead however Alan ended up catching 7 Bream, 4 over 30cm. The biggest measuring 34cm. Lots of Mullet and Grass Whiting around which kept pinching the bait. Packed it up as soon as the Punt came in ruining the relaxing fishing conditions.